Definition at line 74 of file llfloaterbuyland.cpp. Definition at line 135 of file llfloaterbuyland.cpp. Definition at line 322 of file llfloaterbuyland.cpp. Definition at line 332 of file llfloaterbuyland.cpp. References LLViewerParcelMgr::deleteParcelBuy(), gParcelMgr, mParcelBuyInfo, mTransaction, NULL, and sInstance. Definition at line 978 of file llfloaterbuyland.cpp. References LLCurrencyUIManager::canCancel(), FALSE, mCurrency, mTransaction, and TRUE. Definition at line 875 of file llfloaterbuyland.cpp. References finishWebSiteInfo(), finishWebSitePrep(), mTransaction, mTransactionType, NULL, LLXMLRPCTransaction::process(), LLXMLRPCTransaction::status(), LLXMLRPCTransaction::StatusComplete, LLXMLRPCTransaction::statusMessage(), LLXMLRPCTransaction::statusURI(), tellUserError(), TransactionBuy, and TransactionPreflight. Definition at line 955 of file llfloaterbuyland.cpp. References checkTransaction(), LLFloater::close(), LLFloater::draw(), LLCurrencyUIManager::errorMessage(), LLCurrencyUIManager::errorURI(), LLCurrencyUIManager::hasError(), mBought, mCanBuy, mCurrency, LLCurrencyUIManager::process(), refreshUI(), and tellUserError(). Definition at line 683 of file llfloaterbuyland.cpp. References LLXMLRPCValue::asBool(), LLXMLRPCValue::asString(), level, mCurrency, mSiteConfirm, mSiteLandUseAction, mSiteLandUseUpgrade, mSiteMembershipAction, mSiteMembershipPlanIDs, mSiteMembershipPlanNames, mSiteMembershipUpgrade, mSiteValid, mTransaction, mUserPlanChoice, LLXMLRPCValue::next(), LLXMLRPCTransaction::responseValue(), LLXMLRPCValue::rewind(), LLCurrencyUIManager::setEstimate(), and tellUserError(). Definition at line 779 of file llfloaterbuyland.cpp. References LLXMLRPCValue::asBool(), mTransaction, LLXMLRPCTransaction::responseValue(), sendBuyLand(), and tellUserError(). Definition at line 581 of file llfloaterbuyland.cpp. Definition at line 1331 of file llfloaterbuyland.cpp. Definition at line 1338 of file llfloaterbuyland.cpp. Definition at line 1345 of file llfloaterbuyland.cpp. Definition at line 983 of file llfloaterbuyland.cpp. Definition at line 918 of file llfloaterbuyland.cpp. References LLPanel::childSetAction(), mCurrency, onClickBuy(), onClickCancel(), onClickErrorWeb(), LLCurrencyUIManager::prepare(), and TRUE. Definition at line 990 of file llfloaterbuyland.cpp. References LLComboBox::add(), LLViewChildren::BADGE_ERROR, LLViewChildren::BADGE_NOTE, LLViewChildren::BADGE_OK, LLViewChildren::BADGE_WARN, LLPanel::childGetText(), LLPanel::childHide(), LLPanel::childSetEnabled(), LLPanel::childSetLabelArg(), LLPanel::childSetText(), LLPanel::childSetTextArg(), LLPanel::childSetValue(), LLPanel::childSetVisible(), LLPanel::childSetWrappedText(), LLPanel::childShow(), gAgent, LLCheckBoxCtrl::get(), LLCurrencyUIManager::getAmount(), LLPanel::getChildByName(), LLUICtrlFactory::getComboBoxByName(), LLCurrencyUIManager::getEstimate(), LLUICtrlFactory::getTextBoxByName(), LLViewerUICtrlFactory::getTexturePickerByName(), GROUP_LAND_BONUS_FACTOR, i, llceil(), llformat(), mAgentCashBalance, mAgentCommittedTier, mCanBuy, mCannotBuyIsError, mCannotBuyReason, mCannotBuyURI, mChildren, mCurrency, LLAgent::mGroupName, mIsForGroup, mParcelActualArea, mParcelBillableArea, mParcelGroupContribution, mParcelIsForSale, mParcelIsGroupLand, mParcelLocation, mParcelPrice, mParcelSellerName, mParcelSnapshot, mParcelSoldWithObjects, mParcelSupportedObjects, mParcelValid, mSiteLandUseAction, mSiteLandUseUpgrade, mSiteMembershipAction, mSiteMembershipPlanNames, mSiteMembershipUpgrade, mSiteValid, mTransaction, mUserPlanChoice, LLStringBase< char >::null, LLUUID::null, LLComboBox::removeall(), S32, LLViewChildren::setBadge(), LLComboBox::setCurrentByIndex(), LLTextureCtrl::setImageAssetID(), LLView::setVisible(), LLTextBox::setWrappedText(), and LLCurrencyUIManager::updateUI(). Referenced by draw(), setParcel(), startBuyPostConfirm(), and updateCovenantText(). Definition at line 723 of file llfloaterbuyland.cpp. 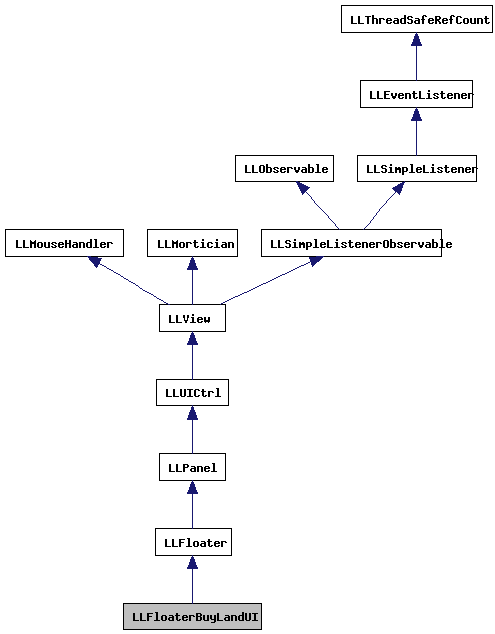 References LLXMLRPCValue::appendInt(), LLXMLRPCValue::appendString(), LLSD::asBoolean(), LLUUID::asString(), LLPanel::childGetValue(), LLXMLRPCValue::createArray(), LLXMLRPCValue::createStruct(), gAgent, LLCurrencyUIManager::getAmount(), LLUICtrlFactory::getComboBoxByName(), LLComboBox::getCurrentIndex(), LLCurrencyUIManager::getEstimate(), LLAgent::getGroupID(), LLAgent::getID(), LLAgent::getSecureSessionID(), LLAgent::getSessionID(), gParcelMgr, mCanBuy, mCurrency, mIsClaim, mIsForGroup, mParcelBillableArea, mParcelBuyInfo, mSiteConfirm, mSiteLandUseUpgrade, mSiteMembershipPlanIDs, mSiteMembershipUpgrade, mUserPlanChoice, params, sendBuyLand(), LLViewerParcelMgr::setupParcelBuy(), startTransaction(), and TransactionBuy. Definition at line 796 of file llfloaterbuyland.cpp. References LLViewerParcelMgr::deleteParcelBuy(), gParcelMgr, mBought, mParcelBuyInfo, and LLViewerParcelMgr::sendParcelBuy(). Referenced by finishWebSitePrep(), and runWebSitePrep(). Definition at line 950 of file llfloaterbuyland.cpp. Definition at line 929 of file llfloaterbuyland.cpp. References mCanBuy, mParcel, mRegion, mTransaction, mTransactionType, refreshUI(), TransactionBuy, updateAgentInfo(), updateCovenantInfo(), updateParcelInfo(), and updateWebSiteInfo(). Referenced by LLFloaterBuyLand::buyLand(), and LLFloaterBuyLandUI::SelectionObserver::changed(). Definition at line 280 of file llfloaterbuyland.cpp. References LLViewerParcelMgr::addObserver(), LLCacheName::addObserver(), LLUICtrlFactory::buildFloater(), cacheNameUpdateRefreshesBuyLand(), LLFloater::center(), gCacheName, gParcelMgr, gUICtrlFactory, LLFloaterBuyLandUI(), NULL, and sInstance. Referenced by LLFloaterBuyLand::buyLand(), cacheNameUpdateRefreshesBuyLand(), LLFloaterBuyLandUI::SelectionObserver::changed(), LLFloaterBuyLand::isOpen(), LLFloaterBuyLand::updateCovenantText(), LLFloaterBuyLand::updateEstateName(), LLFloaterBuyLand::updateEstateOwnerName(), and LLFloaterBuyLand::updateLastModified(). Definition at line 1320 of file llfloaterbuyland.cpp. References LLPanel::childGetText(), mCanBuy, mCannotBuyReason, refreshUI(), and runWebSitePrep(). Definition at line 1277 of file llfloaterbuyland.cpp. References LLPanel::childGetText(), LLPanel::childSetTextArg(), LLConfirmationManager::confirm(), LLCurrencyUIManager::getAmount(), LLUICtrlFactory::getComboBoxByName(), LLComboBox::getCurrentIndex(), LLCurrencyUIManager::getEstimate(), llformat(), mCurrency, mParcelPrice, mParcelSellerName, mSiteConfirm, mSiteLandUseAction, mSiteLandUseUpgrade, mSiteMembershipAction, mSiteMembershipPlanNames, mSiteMembershipUpgrade, and startBuyPostConfirm(). Definition at line 838 of file llfloaterbuyland.cpp. References getHelperURI(), llendl, llwarns, mTransaction, mTransactionType, NULL, params, TransactionBuy, and TransactionPreflight. Referenced by runWebSitePrep(), and updateWebSiteInfo(). Definition at line 906 of file llfloaterbuyland.cpp. References LLPanel::childGetText(), mCanBuy, mCannotBuyIsError, mCannotBuyReason, and mCannotBuyURI. Referenced by checkTransaction(), draw(), finishWebSiteInfo(), and finishWebSitePrep(). Definition at line 362 of file llfloaterbuyland.cpp. References LLStatusBar::getBalance(), LLStatusBar::getSquareMetersCommitted(), gStatusBar, mAgentCashBalance, mAgentCommittedTier, and mAgentHasNeverOwnedLand. Definition at line 519 of file llfloaterbuyland.cpp. References _PREHASH_AgentData, _PREHASH_AgentID, _PREHASH_SessionID, LLMessageSystem::addUUIDFast(), LLPanel::childGetText(), FALSE, gAgent, LLPanel::getChildByName(), LLViewerRegion::getHost(), LLAgent::getID(), LLViewerRegion::getName(), LLViewerRegion::getRegionFlags(), LLViewerParcelMgr::getSelectionRegion(), LLAgent::getSessionID(), gMessageSystem, gParcelMgr, LLMessageSystem::newMessage(), LLMessageSystem::nextBlockFast(), onChangeAgreeCovenant(), REGION_FLAGS_ALLOW_PARCEL_CHANGES, REGION_FLAGS_BLOCK_LAND_RESELL, LLMessageSystem::sendReliable(), LLCheckBoxCtrl::set(), LLUICtrl::setCallbackUserData(), LLUICtrl::setCommitCallback(), LLCheckBoxCtrl::setEnabled(), LLTextBox::setText(), and LLView::setVisible(). Definition at line 590 of file llfloaterbuyland.cpp. References FALSE, LLPanel::getChildByName(), LLUUID::isNull(), refreshUI(), LLCheckBoxCtrl::set(), LLCheckBoxCtrl::setEnabled(), LLTextEditor::setHandleEditKeysDirectly(), LLTextEditor::setText(), LLView::setVisible(), and TRUE. Definition at line 622 of file llfloaterbuyland.cpp. Definition at line 634 of file llfloaterbuyland.cpp. Definition at line 628 of file llfloaterbuyland.cpp. Definition at line 806 of file llfloaterbuyland.cpp. References DB_LAST_NAME_BUF_SIZE, gCacheName, LLParcel::getGroupID(), LLCacheName::getGroupName(), LLParcel::getIsGroupOwned(), LLCacheName::getName(), LLParcel::getOwnerID(), llformat(), mIsClaim, mParcel, and mParcelSellerName. Referenced by cacheNameUpdateRefreshesBuyLand(), and updateParcelInfo(). Definition at line 372 of file llfloaterbuyland.cpp. 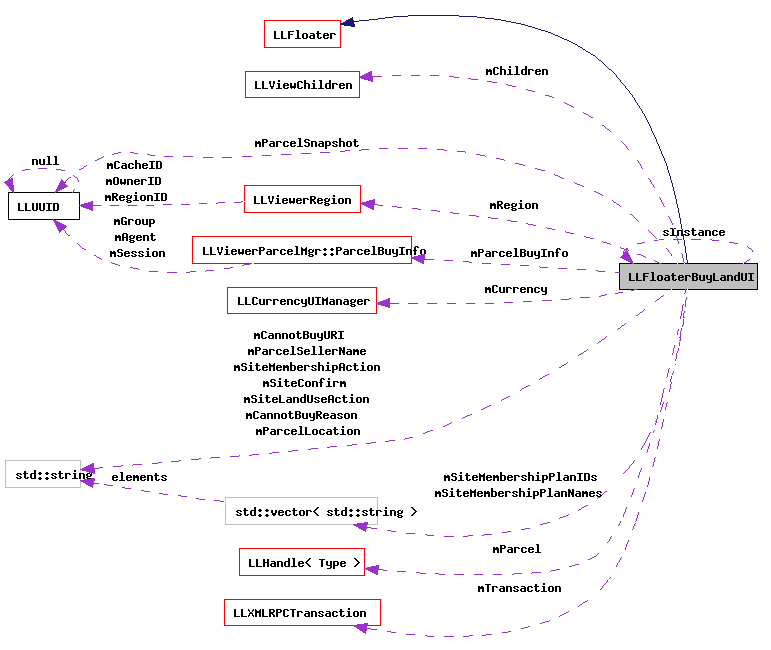 References LLFloater::center(), LLPanel::childGetText(), gAgent, LLParcel::getArea(), LLParcel::getAuthorizedBuyerID(), LLParcel::getCenterpoint(), LLParcel::getClaimPricePerMeter(), LLParcel::getForSale(), LLAgent::getGroupContribution(), LLAgent::getGroupID(), LLParcel::getGroupID(), LLAgent::getID(), LLParcel::getIsGroupOwned(), LLParcel::getMaxPrimCapacity(), LLParcel::getOwnerID(), LLParcel::getParcelPrimBonus(), LLParcel::getSalePrice(), LLViewerParcelMgr::getSelectionRegion(), LLParcel::getSellWithObjects(), LLParcel::getSnapshotID(), GP_LAND_DEED, gParcelMgr, LLAgent::hasPowerInActiveGroup(), LLUUID::isNull(), LLParcel::isPublic(), llformat(), llmin(), llround(), mAgentCashBalance, mCanBuy, mCannotBuyIsError, mCannotBuyReason, mCurrency, mIsClaim, mIsForGroup, mParcel, mParcelActualArea, mParcelBillableArea, mParcelGroupContribution, mParcelIsForSale, mParcelIsGroupLand, mParcelLocation, mParcelPrice, mParcelSellerName, mParcelSnapshot, mParcelSoldWithObjects, mParcelSupportedObjects, mParcelValid, mRegion, S32, LLCurrencyUIManager::setAmount(), LLUUID::setNull(), LLCurrencyUIManager::setZeroMessage(), updateNames(), VX, and VY. Definition at line 640 of file llfloaterbuyland.cpp. References LLXMLRPCValue::appendInt(), LLXMLRPCValue::appendString(), LLUUID::asString(), LLXMLRPCValue::createArray(), LLXMLRPCValue::createStruct(), gAgent, LLCurrencyUIManager::getAmount(), LLAgent::getID(), LLAgent::getSecureSessionID(), mCurrency, mIsForGroup, mParcelBillableArea, mPreflightAskBillableArea, mPreflightAskCurrencyBuy, mSiteLandUseAction, mSiteLandUseUpgrade, mSiteMembershipAction, mSiteMembershipPlanIDs, mSiteMembershipPlanNames, mSiteMembershipUpgrade, mSiteValid, mTransaction, mTransactionType, params, S32, startTransaction(), and TransactionPreflight. Definition at line 95 of file llfloaterbuyland.cpp. Referenced by refreshUI(), updateAgentInfo(), and updateParcelInfo(). Definition at line 94 of file llfloaterbuyland.cpp. Referenced by refreshUI(), and updateAgentInfo(). Definition at line 96 of file llfloaterbuyland.cpp. Definition at line 91 of file llfloaterbuyland.cpp. Referenced by draw(), and sendBuyLand(). Definition at line 86 of file llfloaterbuyland.cpp. Referenced by draw(), refreshUI(), runWebSitePrep(), setParcel(), startBuyPostConfirm(), tellUserError(), and updateParcelInfo(). Definition at line 87 of file llfloaterbuyland.cpp. Referenced by refreshUI(), tellUserError(), and updateParcelInfo(). Definition at line 88 of file llfloaterbuyland.cpp. Referenced by refreshUI(), startBuyPostConfirm(), tellUserError(), and updateParcelInfo(). Definition at line 89 of file llfloaterbuyland.cpp. Referenced by refreshUI(), and tellUserError(). Definition at line 132 of file llfloaterbuyland.cpp. Definition at line 133 of file llfloaterbuyland.cpp. Referenced by canClose(), draw(), finishWebSiteInfo(), postBuild(), refreshUI(), runWebSitePrep(), startBuyPreConfirm(), updateParcelInfo(), and updateWebSiteInfo(). Definition at line 83 of file llfloaterbuyland.cpp. Referenced by runWebSitePrep(), updateNames(), and updateParcelInfo(). Definition at line 84 of file llfloaterbuyland.cpp. Referenced by refreshUI(), runWebSitePrep(), setForGroup(), updateParcelInfo(), and updateWebSiteInfo(). Definition at line 82 of file llfloaterbuyland.cpp. Referenced by setParcel(), updateNames(), and updateParcelInfo(). Definition at line 104 of file llfloaterbuyland.cpp. Definition at line 105 of file llfloaterbuyland.cpp. Referenced by refreshUI(), runWebSitePrep(), updateParcelInfo(), and updateWebSiteInfo(). Definition at line 144 of file llfloaterbuyland.cpp. Referenced by runWebSitePrep(), sendBuyLand(), and ~LLFloaterBuyLandUI(). Definition at line 102 of file llfloaterbuyland.cpp. Definition at line 100 of file llfloaterbuyland.cpp. Definition at line 101 of file llfloaterbuyland.cpp. Definition at line 108 of file llfloaterbuyland.cpp. Definition at line 103 of file llfloaterbuyland.cpp. Referenced by refreshUI(), startBuyPreConfirm(), and updateParcelInfo(). Definition at line 110 of file llfloaterbuyland.cpp. Referenced by refreshUI(), startBuyPreConfirm(), updateNames(), and updateParcelInfo(). Definition at line 109 of file llfloaterbuyland.cpp. Definition at line 107 of file llfloaterbuyland.cpp. Definition at line 106 of file llfloaterbuyland.cpp. Definition at line 99 of file llfloaterbuyland.cpp. Definition at line 129 of file llfloaterbuyland.cpp. Definition at line 130 of file llfloaterbuyland.cpp. Definition at line 81 of file llfloaterbuyland.cpp. Referenced by setParcel(), and updateParcelInfo(). Definition at line 125 of file llfloaterbuyland.cpp. Referenced by finishWebSiteInfo(), runWebSitePrep(), and startBuyPreConfirm(). Definition at line 124 of file llfloaterbuyland.cpp. Referenced by finishWebSiteInfo(), refreshUI(), startBuyPreConfirm(), and updateWebSiteInfo(). Definition at line 123 of file llfloaterbuyland.cpp. Referenced by finishWebSiteInfo(), refreshUI(), runWebSitePrep(), startBuyPreConfirm(), and updateWebSiteInfo(). Definition at line 118 of file llfloaterbuyland.cpp. Definition at line 120 of file llfloaterbuyland.cpp. Referenced by finishWebSiteInfo(), runWebSitePrep(), and updateWebSiteInfo(). Definition at line 122 of file llfloaterbuyland.cpp. Definition at line 117 of file llfloaterbuyland.cpp. Definition at line 116 of file llfloaterbuyland.cpp. Referenced by finishWebSiteInfo(), refreshUI(), and updateWebSiteInfo(). Definition at line 141 of file llfloaterbuyland.cpp. Referenced by canClose(), checkTransaction(), finishWebSiteInfo(), finishWebSitePrep(), refreshUI(), setParcel(), startTransaction(), updateWebSiteInfo(), and ~LLFloaterBuyLandUI(). Definition at line 142 of file llfloaterbuyland.cpp. Referenced by checkTransaction(), setParcel(), startTransaction(), and updateWebSiteInfo(). Definition at line 113 of file llfloaterbuyland.cpp. Referenced by finishWebSiteInfo(), refreshUI(), and runWebSitePrep(). Definition at line 146 of file llfloaterbuyland.cpp. Referenced by soleInstance(), and ~LLFloaterBuyLandUI().